I don’t even know where to start on this gorgeous girl I am about to bring to your attention. It’s like she needs no introduction. But I will try. 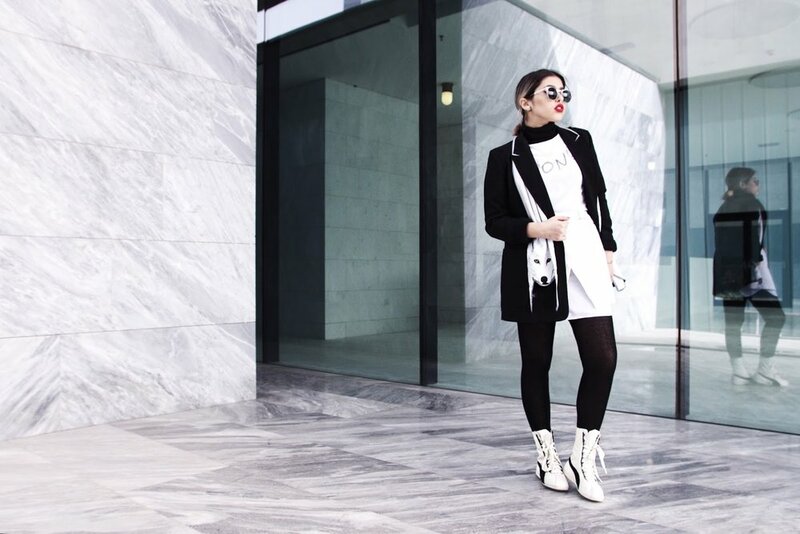 Taiba is a 15 year old who seriously rocks the fashion game. I came across her blog The Urban Analyst a few months ago, after seeing her on Instagram…. continue reading the article on the Huffington Post. by Liz Stephenson, on the Huffington Post here. Howl!!! The Small Arctic Wolf long silk scarf is our fun and animal-friendly twist on the traditional fur stole. Throw this over a jacket or coat for a chic animalistic take on seasonal layering all year around. This designer silk scarf can be worn in the hair as a headscarf, around the waist as a belt, or as a traditional scarf draped over the shoulders or around the neck. Howl!!! The Small Grey Wolf designer silk scarf is a distant cousin to the Small Arctic Wolf. Throw this over a jacket or coat for a chic animalistic take on seasonal layering all year around. Our Small Wolf long silk scarf features very cute hand drawn illustrations inspired by Mexican Lucha Libre wrestling, it is decorated with folk art inspired flowers, circus drums, lipsticks and wrestling masks. Wear it tied in the hair as a headscarf, around the waist as a belt, or around the neck as a traditional long silk scarf. This is our star accessory this autumn. Worn around the neck as a traditional long silk scarf or tied in the hair as a headscarf, this chic Small Wolf scarf in with an all-over paisley and butterfly print will add some playful style to any outfit. The Wolf long silk scarf is our fun and animal-friendly twist on the traditional fur stole. Hooowllll! The Pastel Orange Wolf designer silk scarf will add some playful style to any outfit. Wear it tied around the waist as a belt, in the hair as a headscarf or tied as a bow around the neck. Growl!!!! This neon purple Wolf designer silk scarf will demand attention from everyone it passes. Wear this must have summer accessory as a headscarf, as a belt around the waist, or around the neck as a traditional silk scarf. Did you spot the lovely Aimee-Ffion Edwards wearing our Palm Leaf Tiger on Channel 4's Loaded? Did you catch our cats on The Apprentice Last night? Read the article on Elle France here. Aimee-Ffion Edwards wearing our Palm Leaf Tiger Print Silk Scarf on Loaded. Available to watch on Channel 4 and 4OD.